Thursday February 25[th?] 1897 I finished ironing this morning and put up some lace curtains. I washed a few more in the afternoon and helped Will wash with the shades we [illegible] [illegible] on the rollers and put new hems on them. I read in the evening. John went to town today. Friday February 26[th?] 1897 I was busy with [illegible] all forenoon and got [dining?] early for John to help Frank [Stechman?] cut wood. I was busy all afternoon putting little things to rights. Wrote to mother in the evening. Saturday February 27[th?] 1897 Will took an early start to town with the [illegible]. I though it too cold for me to go John went up to saw wood so late my [dinner?] alone. I was busy all forenoon changing things in some [illegible] and washing in the kitchen. I [illegible] up [illegible] little things in the afternoon and went over to [Ashleys?] for a short time. I put things to rights in the desk at rights. Sunday February 28[th?] 1897 It was a cold cloudy day. We did not go away from the house nor did any one come. We were all busy about this place till noon. I read in [illegible] and wrote in the [illegible]. Monday March 1[st?] 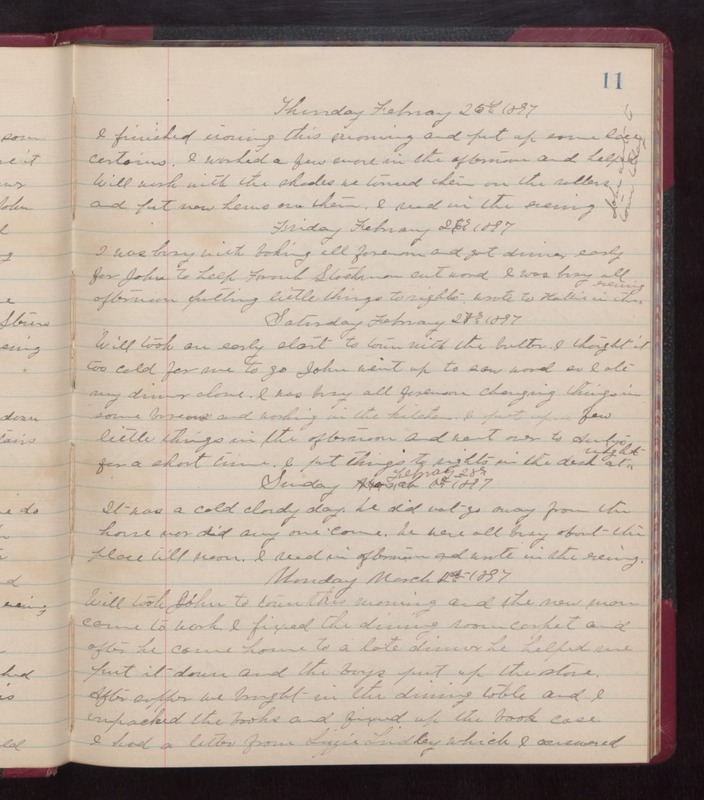 1897 Will took John to town this morning and the new [illegible] [come?] to work. I fixed the dining room carpet and after he come home to a late dinner. He helped some put it down and the boys put up the stove. After supper we [brought?] in the dining table and I unpacked the books and fixed up the book case. I had a [litte?] [illegible] [Lizzie Lindley?] which I answered.